With Google’s expansive booth set up on the CES floor, we’d already got the hint that the search giant was planning something big. Google has today announced that the Google Assistant is ready to take on the Amazon Echo Show and Spot with its own set of ‘Smart Displays’ – as the search giant likes to call them. Ever since Amazon added a screen to their coveted Alexa-powered speakers, we had been waiting for Google to follow suit. It was expected sooner or later, thanks to the heating up rivalry between two of the biggest giants in the smart speaker/assistant ecosystem. We’ve seen both Google Assistant and Alexa find its way into many different pieces of hardware. But, it seems that the company pulled a fast one on us by not adding a screen to its Google Home speaker. It has gone one step further and debuted an ecosystem of touchscreen devices that’ll benefit from Google Assitant’s smarts. Google likes to call them ‘Smart Displays’ and it has already got a bunch of partners, such as JBL, Lenovo, LG, and Sony, on board. If you’re thinking that Google has just given us Android tablets with Google Assistant on board, well you’re gravely mistaken. The smart displays surely bring along most of the company’s services, such as video calling using Duo, video streaming via YouTube, Google Photos, and a lot more. The homescreen of the smart displays will resemble that of Google Now, which means it will show you everything from the weather forecast, and calendar appointments to traffic notification before you leave for work and other updates. You’ll be able to ask Google Assistant questions just like you did before, but you now also have a screen to interact with. The smart displays will now provide you an even intuitive user experience. As for the underlying platform on smart displays, it is being said that Google Assistant is running atop the company’s ‘Android Things’ IoT platform. It is a skinned version of Android, designed especially for the Internet of Things devices. The platform is currently in developer preview, but the smart displays might be the required boost it needs to find a spot among hardware makers. Just moments after Google’s announcement, Lenovo has shown off their first-ever Smart Display that’s powered by Google Assistant’s smarts. The Lenovo Smart Display is basically a trimmed-down and minimalistic version of Amazon’s Echo Show. It looks gorgeous and I am completely sold on Google’s action plan for the AI assistant here. Lenovo’s Smart Display features two variants, with large 8-inch and 10-inch screens and is backed by the newly announced Qualcomm Home Hub platform. It’s powered by Qualcomm SDA 624 SoC, which integrates everything from CPU, GPU and DSP to robust Wi-Fi and Bluetooth connectivity options. 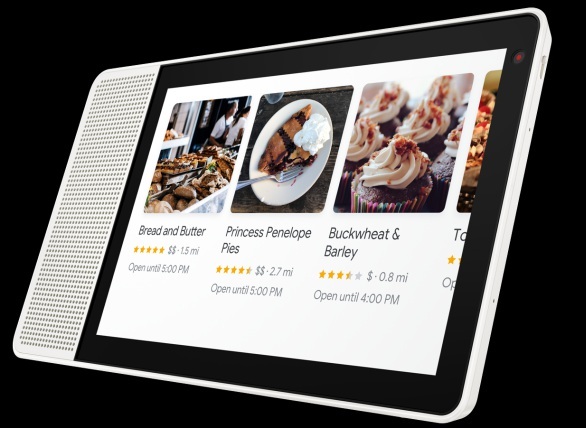 Lenovo Smart Display’s 8-inch variant will retail at $199.99 whereas the larger 10-inch variant will require you shell out $50 bucks above that. The Chinese giant isn’t only offering you different screen sizes but two colour options, namely natural bamboo and soft grey, as well. They’re expected to become available for purchase in early summer. This is just one of the many Google Assistant-backed smart display’s that will be launched in the coming weeks. It is a massive leap for Google Assistant who’ll not be giving its arch-rival an even tougher competition in the smart speaker (with a screen) market. Echo Show, you better be beware now! There’s a new screen in town and it’s much more robust and smarter than you. What do y’all think about this? Will Google’s smart displays be able to supersede the Amazon Echo Show and Spot’s? Share your opinion down below.